In Warnings, I write about the thousands of lives and millions of dollars routinely saved by meteorologists. We have come to count on the expertise of weather science for planning trips and taking shelter. But, how about when the entire fate of the free world was in balance? The following, in part, is excerpted from WWII History, March, 2010 by Gene Pfeffer. There are many books and movies written about the Allied invasion of Europe that turned the tide against the Nazis in World War II. Some, like The Longest Day, allude to the weather forecast playing a role in Eisenhower’s decision when to begin the invasion. And, when I visited the Eisenhower Library in Abilene, Kansas, a number of years ago there was a display case with various meteorological documents relating to the invasion. Mr. Pfeffer’s account, to my knowledge, is the first time the back story of this momenteous weather forecast was made. Organizing the 500 warships and 3,000 landing craft and getting them safely across the English Channel was a massive undertaking. High seas or high winds would risk swamping the landing craft. The cloud cover for the Allied bombing needed to be within acceptable limits. The winds could not be too high for the paratroopers. 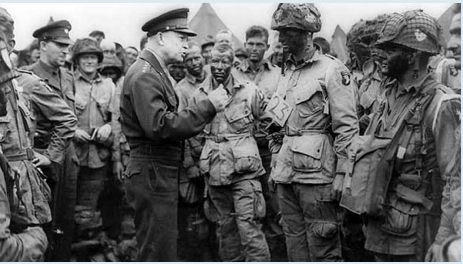 Eisenhower created a team of meteorologists lead by the British Met Office’s J.M. Stagg and by U.S. Army Air Force’s (USAAF) Donald Yates as deputy. The initial efforts were met with controversy. “Hap” Arnold, Chief USAAF said, “they have lost [to weather] more bombers than they have lost to enemy fire.” He said he was going to send the Air Force’s best forecasters, Ben Holzman and Irving Krick. 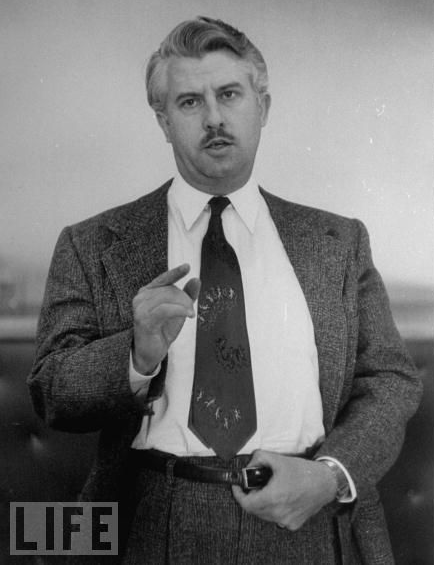 Krick was the first commercial meteorologist – ever. Prior to WWII, he made the weather forecast so David O. Selznick could stage the “burning of Atlanta” scene for Gone With The Wind. Because they were burning old movie scenery, there would be no second chance. Krick got the forecast right and it was turned by Selznick into one of the most dramatic scenes in one of the most popular movies in history. When the forecast had to be made for the invasion, there was no weather radar, no weather satellites, no computer models of the atmosphere, but there was lots and lots of ocean – vast areas where no weather stations could gather information. The meteorologists had to piece together enough data to make a forecast from ships and aircraft. Plus, the aircraft tended to avoid major storms so didn’t collect data where it was needed the most. Gen. Bedell Smith, Eisenhower’s chief of staff, was tasked with organizing the forecast effort. He told Stagg and Yates that they would make 5-day forecasts each morning for the Channel and the coast of France. Eisenhower needed four days to make the decision. These forecasts began in April, 1944. The most depended-on method for making these weather forecasts was the analog method of Krick. Analog weather forecasting is based on finding a similar or nearly identical set of weather conditions in the past and making a forecast based on what actually occurred previously. The British had doubts about the Krick method which added to the bickering. 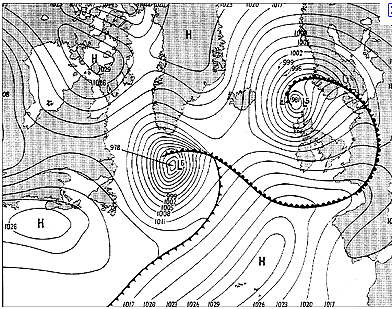 As D-Day approached, it became obvious to the Allied meteorologists that a giant high pressure system (with widespread fair weather) was not in the offing. They were going to have to give Eisenhower a window of opportunity in between storm systems. On Sunday evening, Stagg told Eisenhower that there would be a window of opportunity on Tuesday, June 6th. Eisenhower made the decision to proceed and confirmed the decision the following day. Eisenhower talking to the troops before the invasion was launched. The weather during the invasion was just about what was forecast and the fall of the Third Reich was set in motion.Weather science was the tool that allowed Allied forces to save the world. The Allied forecasts were treated as highly classified information. 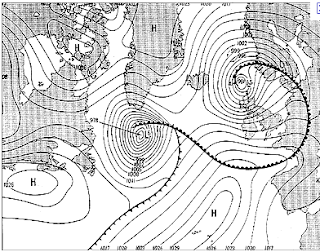 German meteorologists, captured after the war, admitted they missed the forecast for D-Day (which meant the German command did not anticipate the invasion would be on June 6th) because of the Allied air and sea superiority over the North Atlantic.They could not collect the data needed to see that a break in the weather was coming.